Explore the Kennebunk River by boat the next time you stay at our Kennebunkport Bed and Breakfast. It’s sunny and warm at our Kennebunk/Kennebunkport Bed and Breakfast, and glorious weather is expected for the foreseeable future. Foliage is peaking in the northern portion of the state, though we’re still waiting for the leaves to peak here. We expect the change to take place any day now, especially as our nights turn cooler. This is one of the best times to explore the coast of Maine by boat. The water off Kennebunkport is fairly cool – just under 60 degrees – but it’s much warmer now than it will be in a few months. There is much less boating traffic now than during the summer, but it’s still possible to rent boats and enjoy chartered trips and tours. Many guests of our Kennebunkport/Kennebunk Bed and Breakfast bring kayaks and canoes with them. 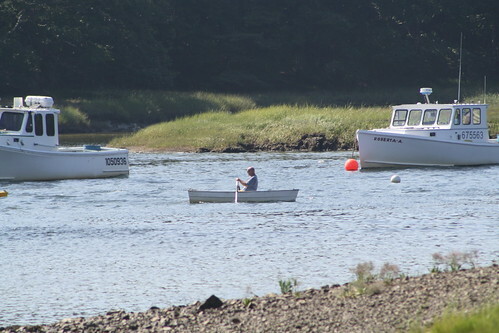 Folks who don’t have their own boats may rent them at nearby Kennebunkport Marina, which provides single and double kayaks, canoes, Boston Whalers, Inflatables, and Outrage boats. Meander up and down the coastline or head up the Kennebunk River. People who feel uncomfortable captaining their own boat may be interested in some sort of scenic cruise. Several options are available. Spend an hour aboard a classic wooden lobster boat, watching (or helping) haul in lobster traps. Call 207.468.4095 for more information. Take a guided kayak tour through Kayak Excursions. All levels welcome. Enjoy a romantic Sunset Excursion aboard a sailboat. Call Pineapple Ketch, 207.468.7262. Embark on a Chartered Trip with Tidewater Fishing Charters. Nothing feels better after a day on the water than curling up by the fire with a warm drink or a glass of wine. Several rooms in our Bed and Breakfast Kennebunkport/Kennebunk have their own gas fireplaces, and guests are always welcome to relax in the common areas. Or warm up after a chilly outing with a hot bath, and enjoy a glass of wine in your room before heading out to dine at one of the many nearby restaurants.